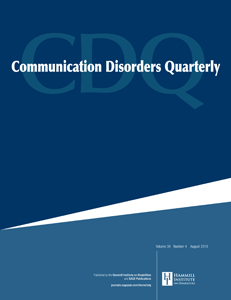 Communication Disorders Quarterly is a journal of research, intervention and practices in speech, language and hearing. It is the official journal of CEC’s Division for Communication, Language, and Deaf/Hard of Hearing. Each issue has the following features: quantitative and qualitative research articles, Clinical Forums, short tutorials, From the Field Interviews, and a comprehensive conference calendar. Communication Disorders Quarterly (CDQ) presents cutting edge information on typical and atypical communication — from oral language development to literacy. The journal also offers assessment of and interventions for communicative disorders across the lifespan. It includes research reports, a clinical forum that reports theoretical applications in clinical and educational settings, short tutorials on specific topics or clinical procedures, and media reviews. This journal is a member of COPE. Special Series are created by Associate Editors and/or interested professionals from the field. These are composed of 3-6 related articles that are invited and edited by the Special Series editor. Please contact the Editor in Chief if you are interested in hosting a series. CDQ has an international Board of Reviewers, and publishes several articles each year from authors outside the United States. The largest percentage of subscriptions of CDQ are held in Europe. Online access is available to subscribers by visiting cdq.sagepub.com. Manuscripts may be submitted at any time, using the Manuscript Central URL. Information for authors is available at the same site.